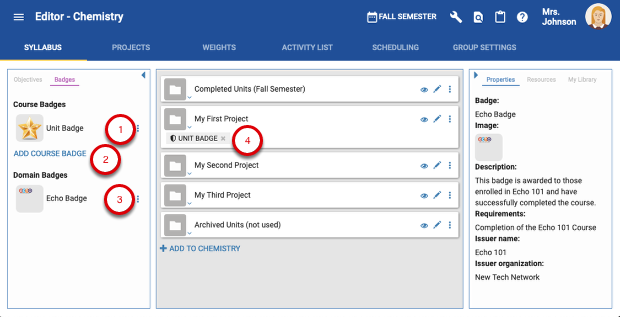 When using the Teacher App, click on the pencil icon on any course card to open the course editor. Use "Syllabus" to structure your course, author, content, and align it with objectives and badges. Use "Projects" to build robust, student-guided projects for project-based learning (PBL). 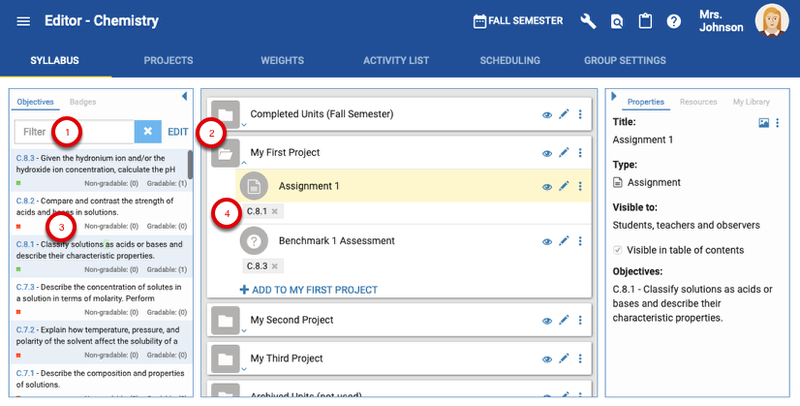 Use "Weights" to define and manage grade weights for activities and categories. 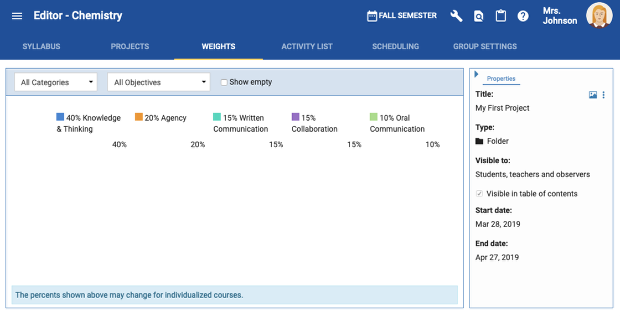 Use "Activity List" to review your course structure and preview activities. 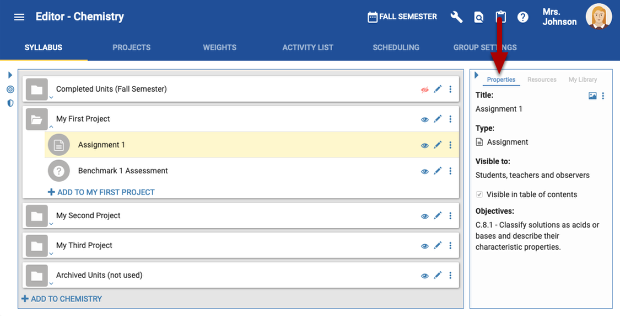 Use "Scheduling" to review your calendar, create and adjust due dates, and plan your course. Use "Group Settings" to manage existing groups. Note: if your course is using Grading Periods, you may need to use the dropdown to author content in a different grading period than the current one. The Objectives/Badges panel on the left. Use the arrow to expand and collapse the panel. The folder and activity structure in the middle. The Properties/Resources panel on the right. Use the arrow to expand and collapse the panel. Click Edit to add and/or import objectives. Drag and drop objectives to folders and activities to align them (item to receive objective changes to a green color when dragging and dropping). Click on the "three dots" settings button next to a course badge to bring up a dropdown to edit, delete, or view details of existing course badges. Click on the "three dots" settings button next to a domain badge to view domain badge details. Drag and drop badges to folders and activities to align them (item to receive objective changes to a green color when dragging and dropping). Change visibility to Teachers only by clicking on the "eye" icon. It will turn red and a line will appear going through it. Folder visibility settings apply to all items underneath even they are not displayed as invisible, meaning a teacher does not need to hide all items in a folder, just the folder itself. Change visibility for individual items by clicking on the "eye" icon. Edit folders and activities by clicking the pencil (edit) icon. 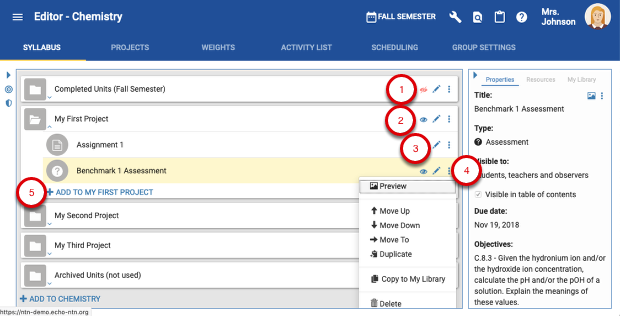 Open the side menu (three dot icon) to Preview, Reorder (moving up/down/to), Duplicate, Copy to Library, or Delete folders and activities.You can also reorder folders and activities by clicking and dragging them to the desired location. Add folders and activities to the course. When a folder/activity is selected from the center panel or an objective/badge from the left panel, the item properties can be reviewed (Title, Type, visibility settings, due dates, objectives, etc). Click the photo (preview) icon to preview and the side menu to make edits. 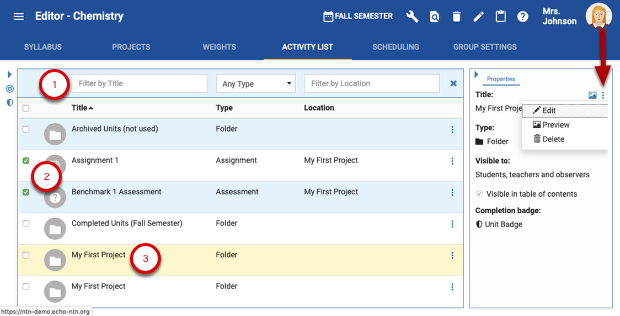 The Resources tab allows you to manage course resources (i.e., create new folders; upload new resources; find, preview, download, and delete existing resources). Choose resources folders to filter the displayed resources. Create a new folder for resources. Use the three dots icon next to a resource to download, preview, delete, move, or view the history of the resource. Drag and drop resources into course folders. Toggle between a list and tiled view of existing projects using the visual icons. Create new projects, for which you provide a Title, Start date, and End date. Add content from the Digital Library. Convert existing folders into projects, for which you provide the folder, Start date, and End date. Click on displayed project icon to edit it with the Properties/Resources panel. Grading Weights define how much impact that activity’s grade has on the final grade, relative to the other gradable activities in the same category and/or course. 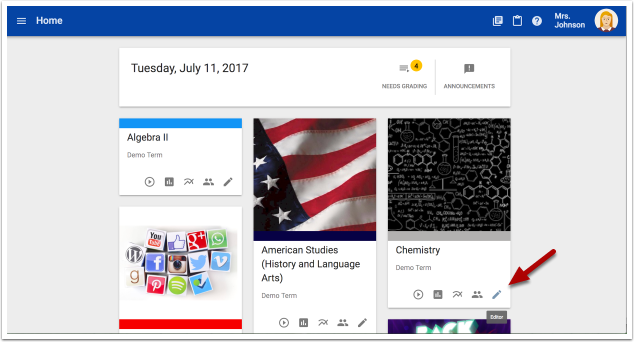 Filtered displayed folders and activities by Title, Type, and/or Location. Select multiple folders and/or activities using the checkboxes to make edits or delete them using the three dots icon. Select folders and activities to view their Properties, as well as use the three dots icon in the Properties tab to Edit, Preview, or Delete. Syllabus View, which shows the folder structure and orders folders and activities according to the order created in the Syllabus tab. List View, which lists folders and activities in alphabetical order, doesn't show the folder structure, and allows you to Show All items or only Unscheduled items. 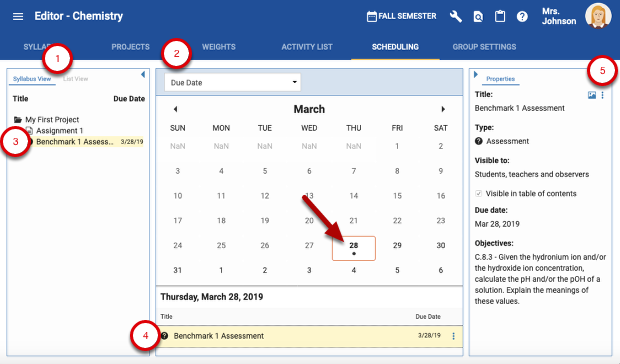 Drag and drop folders and activities onto dates on the calendar to assign Due Date, Visibility Date, or Grade Release Date, depending on what is selected in the calendar dropdown. 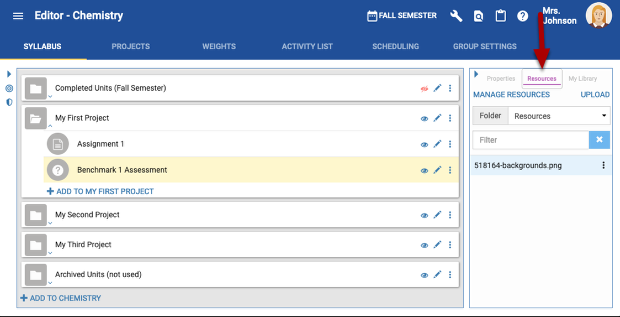 Select activities displayed in the calendar, Syllabus View, and List View to see their Properties displayed. Use the Properties tab (three dots icon) to Edit, Preview, or Delete folders and activities. Filter the displayed folders and activities by Group Set. Property, which allows you to organize by Visibility or Due Date in the second dropdown. 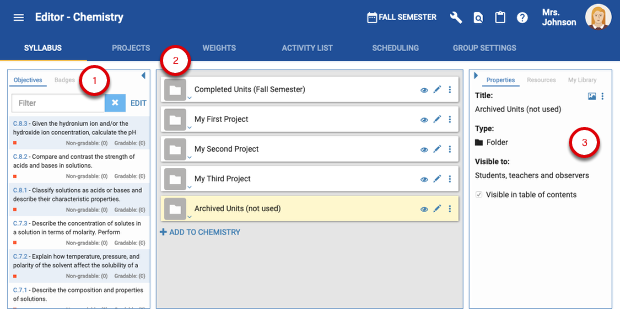 Activity, which allows you to organize using folders in your Syllabus in the second dropdown. Group, which allows you to organize by groups within the chosen group set in the second dropdown. Select a folder or activity to see it's Properties and use the side menus to Edit, Preview, or Delete folders and activities. Toggle visibility to student group sets using the eye (visibility) icon. Course Settings, which has controls for the course's general setup, appearance, and gradebook and scoring information. Landing page, where you can manage the content for the landing page of the course. Course Links, which allows you to provide students with links to important course resources. Edit Objectives, which provides a list of standards that can be imported into the course or added manually. Manage Groupings, which allows you to create, edit, and delete group sets. Recycle Bin, which allows you to review and restore deleted content. The Find Activity icon, which allows you to search by activity title or ID. When you find the activity you're looking for, click to jump to it. The Go To Clipboard button. See this article for more information on how to use the Clipboard tool. The Help (question mark icon) button. Click on this to bring up a search menu that you can use to find articles in our Help Center that can answer your questions.